The first event of the Tomatina begins around 10 o’clock. It is a game called “el palo jabón”, similar to “Greasy pole”, which consists in climbing to the top of a greased post where a piece of ham is placed. Meanwhile, the crowd is dedicated to sing and dance frantically while being showered in water from hoses. Once someone is able to drop the ham off the post, the tomatoes battle starts. The sign for the beginning is at about 11 a.m., when a firecracker sounds, and the chaos begins. Several trucks throw tomatoes in abundance in the square called Plaza del Pueblo. The tomatoes come from Extremadura, where they are less expensive and are cultivated specially for these holidays, since they are not of good taste for consumption. For the participants the use of safety glasses and gloves are recommended. The tomatoes must be crushed before being thrown so that they do not produce injuries anybody. After exactly one hour, the fight ends with the sound of a second firecracker, announcing the end. The whole square is colored in red and rivers of tomato juice are formed. Fire trucks clean the streets. 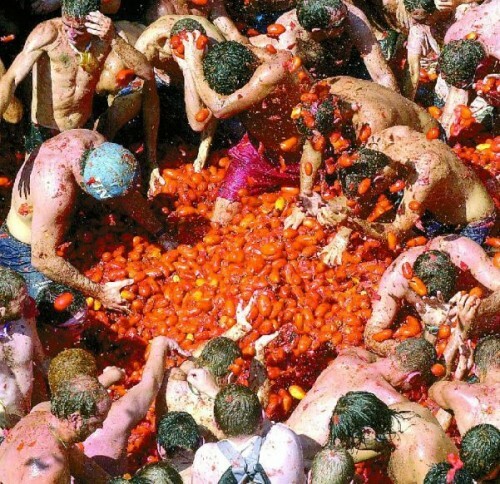 The participants take advantage of the hoses that the locals give them to remove the tomato stuck to their bodies. Some participants go to the pool of “los peñones” to wash themselves. After cleaning, the streets of the village, which are cobblestone, remain pristine due to the acidity of the tomato that disinfects and thoroughly clean all surfaces. In 1945, during a parade of gigantes y cabezudos, young men who wanted to be in the event staged a brawl in town’s main square, the Plaza del Pueblo. There was a vegetable stand nearby, so they picked up tomatoes and used them as weapons. The police had to intervene to break up the fight and forced those responsible to pay the damages incurred. This is the most popular of many theories about how the Tomatina started. The following year the young people repeated the fight on the same Wednesday of August, only this time they brought their own tomatoes from home. They were again dispersed by the police. After repeating this in subsequent years, the tradition was established. In 1950, the town allowed the tomato hurl to take place, however the next year it was again stopped. A lot of young people were imprisoned but the Buñol residents forced the authorities to let them go. The festival gained popularity with more and more participants getting involved every year. After subsequent years it was banned again with threats of serious penalties. In the year 1955, some young people planned to celebrate “the tomato’s funeral”, with singers, musicians, and comedies. The main attraction however, was the coffin with a big tomato inside being carried around by youth and a band playing the funeral marches. Considering this popularity of the festival and the alarming demand, 1957 saw the festival becoming official with certain rules and restrictions. These rules have gone through a lot of modifications over the years. In 1975 “Los Clavarios de San Luis Bertrán” (San Luis Bertrán’s army; San Luis Bertran is the patron of the town of Buñol ) organized the whole festival and brought in tomatoes which had previously been brought by the local people. From this year until 1980 they charged to organize the feast and provide the necessary tomatoes. The feast began to be popular in the rest of Spain thanks to a reportage, broadcast on the program of Spanish television Weekly Report. From 1980, the Town hall is the tomatoes provider to the participants who, year after year, increase in number and enthusiasm. 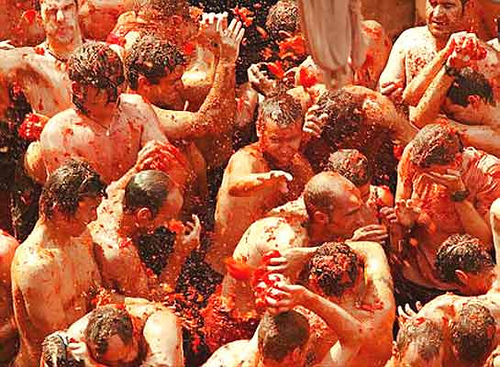 The success has led to that the Tomatina is considered since August 2002 Festival of international tourist interest by the General Secretariat of tourism. • Wear closed shoes that you deem not much and tie them to the legs; Flip-flops can be lost in the crowd. • Wear old clothes or that you do not use again any more, it is very likely that your clothes end up broken. • The glasses of diving can be very well suited in this case. The acid of the tomato stings the eyes, but it cleans the skin. • If you want to take photos, use a waterproof camera. • Do not ascend any windows, bars, pillars, etc. to better see – you will be an easy target. • Don’t miss the palojabon game: a post smeared in soap and of which a ham hangs. The goal is to climb teh post and take the ham. • And, of course, enjoy as much as possible. It is a joy to do something as absurd as throw tomatoes to right and left during one hour.